Replica of the FDNY Squad 18 firehouse. Laser-cut basswood kit. Quick to build, and very detailed. 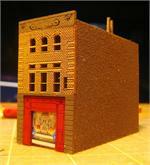 This is the New York Hook & Ladder 8 in Z scale. Known as the Ghostbusters Firehouse. Laser cut.Basswood and Birch construction. One of the oldest firehouses in Boston. This beautifully detailed kit comes with a removable roof and separate doors that can be adjusted to the height that you desire. 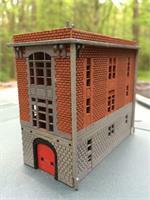 Build this kit either as a Police Station or as a Railroad Station. The kit has an interior flooring with a counter. Beautiful detail! The roof is removable. This little model is an astounding work of art! There's an interior, graphics, and even counters. This model is made from hardwood and the body is engraved to add to the detail. This was an actual building in Brroklyn, NY.